The osprey is a large black and white raptor, up to two feet tall and with a six-foot wingspan. Although ospreys are found worldwide, the effects of pesticides – particularly DDT – almost wiped out these grand birds in the United States, where they are still considered a threatened species. As runoff from pesticides entered waterways and became concentrated in fish, the osprey’s almost purely fish diet resulted in an extremely high concentration of the chemical in the bird. Besides causing the bird to become ill, the DDT caused the osprey’s eggshells to be too thin, killing off subsequent generations. After DDT was banned in 1972, the osprey population slowly recovered. Now, you’ll see osprey around most waterways in Florida, particularly during the cooler months. 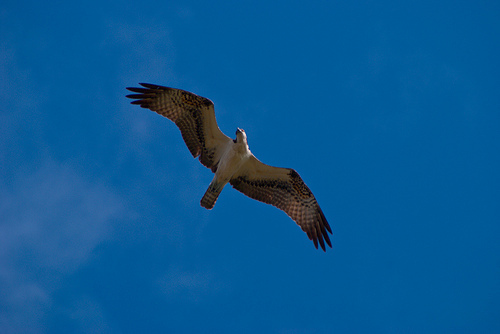 Some of Florida’s ospreys are not permanent residents, but “snowbirds” that migrate south for the winter. Ospreys mate for life, returning to the same nest every season. The eggs take five weeks to hatch. Although the female sits on the eggs the majority of the time, the male will take over occasionally to give her a break to go fishing. After the chicks hatch, the male cares for the family’s needs for the next six weeks. Once the chicks are large enough to be left alone, both parents participate in feeding them until they are old enough to be taught to fly—and fish.